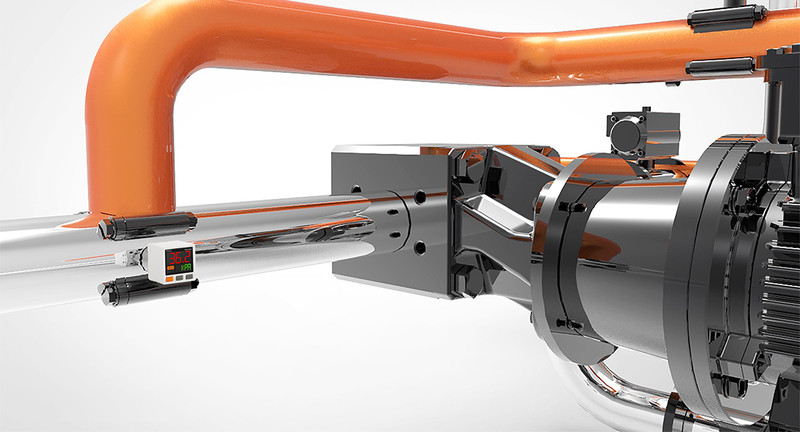 Dual display pressure sensors are used to check and confirm reference pressure in pipes of packaging lines. 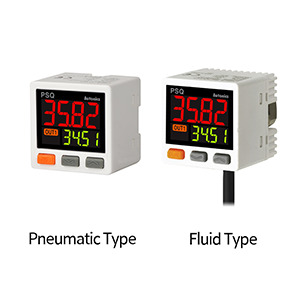 The PSQ series dual digital display pressure sensors can simultaneously display PV and SV for easier status readings. The 12-segment LCD display is capable of displaying various alphanumeric characters for clear identification, and the main (PV) display can be displayed in 3 different colors depending on status or configuration. Installation and configuration of multiple sensors is made easy with the copy parameter settings function and users can switch between NPN and PNP open collector output options through parameter configuration settings. 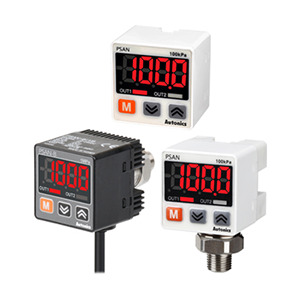 The PSAN compact digital pressure sensors are available in cable type (fluid type only) and connector types (fluid type, pneumatic types). The versatile sensors are capable of measuring and displaying various types of pressure including gas, liquid, and oil. The PSAN series features various convenient functions such as zero-point adjustment, peak value monitoring, and chattering prevention. Two independent outputs are available with an option to choose between normally open and normally closed outputs.